If you are thinking about taking home a new Nissan Titan pickup truck soon, you may be wondering what updates have been made to the 2019 model. This is a popular full-size truck model that was originally offered to consumers in 2004, and it received a major facelift in 2016 when the second generation was released. Only a few minor improvements have been made to the 2019 model year. One of these is a larger infotainment screen on the dashboard. You may also appreciate a new safety feature and an optional upgraded Fender audio system. A great way to get to know more about these improvements and to compare available trims is to visit with our dealership's sales professionals soon. With six trims and three cab options available for the 2019 Nissan Titan, this is a truck that meets most needs. The cab options available include single, king and crew. The trims from lowest to highest are the S, SV, SL, Pro-4X, Midnight Edition and Platinum Reserve. 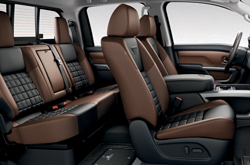 Regardless of the Titan that you take home, you will enjoy ample passenger seating, cloth or leather interior in a variety of color options and access to an impressive selection of features. 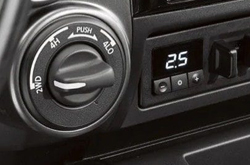 Some of the standard or optional features available for the 2019 Titan include remote keyless entry, power door locks with speed sensitivity, a push-button ignition, a navigation system, Bluetooth connectivity, USB ports, power windows with one-touch auto down, mounted controls for cruise and audio on the steering wheel, wireless headphones for the rear row entertainment system, HD radio, Android Auto, Apple CarPlay, a color infotainment screen, a climate control system, SiriusXM satellite radio and a few other features. Our Nissan team is eager to provide you with trim-specific information when you reach out to us. 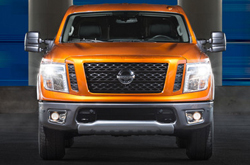 How Much Power does the Nissan Titan Have? Performance capabilities require serious review when you are preparing to take home a new full-size pickup truck. Several powertrains are available for the 2019 Nissan Titan, which makes it easy to find a Titan that meets your needs. One of several engine options is a V8, 5.6-liter gas-powered engine with an automatic transmission, and it gives you 390 horsepower with 395 foot-pounds torque. This and other powertrains available for the new model year are paired with hill start assistance, front and rear ventilated disc brakes, electronic brakeforce distribution, iridium-tipped spark plugs, VVEL technology, rear-wheel drive, front and rear stabilization bars, anti-lock brakes, an independent suspension with a rear multi-leaf and front double-wishbone design and several other well-designed features. Test driving all powertrain options available for the 2019 model year is a smart way to find the Titan that is right for your needs. Regardless of whether you plan to use the 2019 Nissan Titan as your everyday commuting vehicle, your fun weekend vehicle to haul your toys around or a work truck, safety features require close inspection. 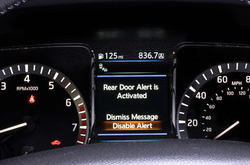 Nissan has introduced a new driver's alert feature that signals when the rear doors are open. This is designed to protect children and pets that may be in the back row of the truck. Many current safety features carry forward from last year's model. A few of these are trailer sway control, a blind spot monitor, a TPMS with an easy-fill alert, a rear cross-traffic alert, active brake limited slip, hood creases, LATCH child safety features for the back row, crumple zones in the rear and front, side steel guard beams, front seatbelt pretensioners, load limiters and 3-point safety harnesses for all passengers, an energy-absorbing steering column and a few additional features. We are available to answer your questions about each Titan trim and to assist you with a test drive. What are you waiting for? Find your Titan now!